Patient A presented with necrotic pulp and a draining buccal dental abscess associated with tooth 46. Orthograde endodontic treatment was performed for the tooth over two visits with calcium hydroxide dressing. At the first visit, the tooth was accessed and irrigated with NaOCl. Shaping of the canals was achieved with ProTaper Next instrumentation XA, X1, and X2. 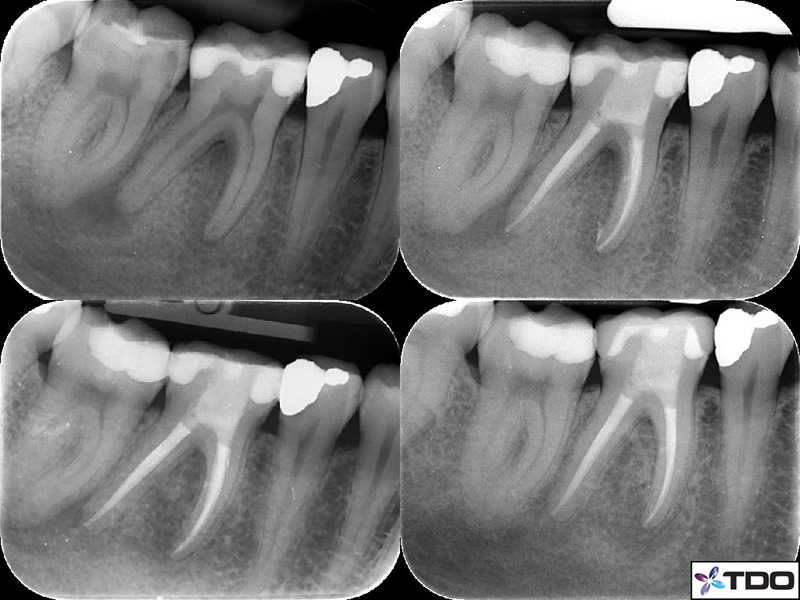 Two weeks after debridement was completed Patient A was asymptomatic with the tooth and reported that the draining abscess associated with the tooth had ceased. The tooth was obturated with gutta percha and AH Plus sealer. A composite resin restoration of the access was completed. At 6 months there is increased bone infill, and the tooth was recommended for rehabilitation with a crown. At 12 months the crown has been placed by our referring dentist, and the tooth is asymotomatic and functional. Radipograph demonstrates near complete bone infill.